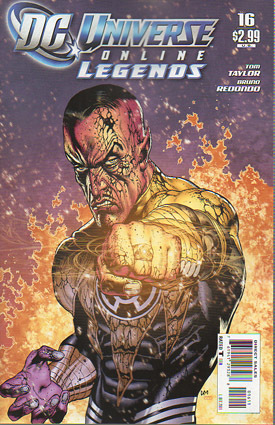 "The Brainiac Sinestro Corps War - Part 1"
Recap: While Brainiac attacks the Sinestro Corps in the skies above Sinestro's home world Korugar, the Guardians of the Universe direct their entire Green Lantern Corps to contain the battle around the planet, but not to interfere. While Hal Jordan is against the idea of forcing both sides to simply wipe each other out, Guy Gardner thinks it's wonderful. At the same time, Corps member Soranik Natu whose home planet is also Korugar, cringes at the thought of what the battle might be doing to the populace, so Kyle Rayner does his best to comfort her. When they arrive, the planet is practically split open from the fighting. Soranik tries to join the battle, but the other lanterns trap her in an orb construct where she wails in disbelief. Sadly, every citizen of the world has already died. The Corps follow their orders and construct a barrier to trap Brainiac's robots and the Sinestro Corps. One of the Yellow members thinks the Green Lanterns are there to help, but becomes trapped in the barrier where a robot comes up from behind a punches a hole through her back and out her abdomen. John Stewart remarks that this just doesn't feel right, but Guy Gardner uses his ring to make a comfortable easy chair and a box of popcorn because he's enjoying seeing both sides wipe each other out. Hal realizes that the reason the Sinestro Corps are losing so badly is because Brainiac's exobytes are actually destroying the yellow power battery that is the source of the Sinestro Corps's constructs. Against orders, Hal convinces Kilowog to let him through the barrier, and on the surface of the planet, he is confronted by Sinestro who immediately blames Hal for the death of his world. Story - 5: First off, Superman does NOT appear anywhere in this book, so I'm keeping it short and sweet. This is a very fast-paced introduction and I can't wait to see where the story goes from here, but we already know that in the future that Brainiac has bottled the capital city of Korugar because Lex Luthor, Atom and Black Canary entered it and stole yellow power rings from dead Sinestro Corps members to fight Brainiac in issue 5. Even though it's a very fast read, there's a lot of emotion and good use of individual Corps members. I especially feel for Soranik Natu who is forced to witness the death of her planet and powerless to do anything about it. There was another good visceral moment when the Sinestro Corp Member thought the Green Lanterns would save her just before she was brutally killed. John's reaction was priceless and as usual, a voice in my head says "Shut up, Gardner." I'm a little unclear what Hal thought he would be able to do once he reached the yellow power battery. It was a way to get him to meet up with Sinestro, but it's awkward in the storytelling. Art - 5: Bruno Redondo did an outstanding job with the art. I've said for a long time that artists on Green Lantern stories need to be even better at their jobs than some other comic artists because of the limited color palette. He managed to catch all the individual emotional journeys effectively and that aided the storytelling. Cover Art - 4: Good, but not great. I'll only give a five to covers that have all the criteria that I look for, and the only missing component here is that it doesn't stand out on the comic store wall and say, "You should buy me." So it's a good cover and there's nothing actually wrong with it, there just isn't enough right with it to make it a five.